Disney plans to remove its infamous ride. Members of the Walt Disney Imagineering team have been toying around with the idea of diminishing the Twilight Zone Tower of Terror ride for months now, and their dream could possibly come true soon. The United States’ Disney theme parks are planning on getting rid of the attraction in both of its locations: Disney California Adventure in Anaheim, California and Walt Disney World in Orlando, Florida. The Twilight Zone Tower of Terror, simply known as the Tower of Terror, is based on the cancelled CBS television series, The Twilight Zone, created by Rod Serling. 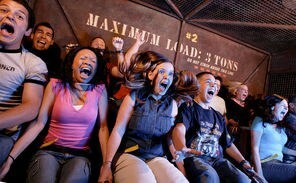 The ride imitates an elevator of the infamous Hollywood Tower Hotel. Riders are unable to see in the pitch black as they are launched upward and downward at high speeds. The Tower of Terror is a staple attraction at each Disney park and the reason I venture to the Hollywood Studios park in Walt Disney World. The Walt Disney Imagineering team plans to replace the Tower of Terror in California with a Guardians of the Galaxy attraction. Guardians of the Galaxy received much attention when it first came out in 2014, and movie viewers argued that it was one of Disney’s best and most popular movies. The project of constructing an attraction based on the movie has not received the “okay” yet but definitely expects to. Those who want to ride the Tower of Terror at Disney California Adventure one last time should plan to do so before fall of 2016. Assuming that the project is allowed to commence, the Tower of Terror will be shut down in the fall and the Guardians of the Galaxy attraction will be ready to ride in May of 2017. The Tower of Terror in Florida is supposedly going to be replaced by a Frozen attraction. Frozen is recorded as the highest grossing animated film of all time and, as an avid Disney movie watcher, I can attest to the movie being the one of Disney’s best animated movies EVER. Florida’s Tower of Terror will possibly be removed and replaced by Elsa’s Ice Castle, a feature that appears in the hit movie. Although there is not much information on the replacement of the Walt Disney World’s Tower of Terror, the project is expected to go underway later this year, assuming that it gets the green light. I know that Disney could do wonders in creating Guardians of the Galaxy and Frozen attractions, but is removing the infamous Tower of Terror ride a good call? The ride is one of the parks’ most popular attractions that has been around for years. It is a destination ride for many Disney-goers, so will getting rid of the ride discourage patrons from visiting the parks? Disney parks are engineered toward attracting people of all ages, including adults that are kids at heart, such as myself. However, there are limited attractions for adults. With the Tower of Terror being one of the only fast-paced rides in both the California and Florida locations, will adults refuse to visit Disney parks and find a replacement amusement park to go to, such as Universal Studios? Stay strong, Disney. Don’t let Universal Studios win.